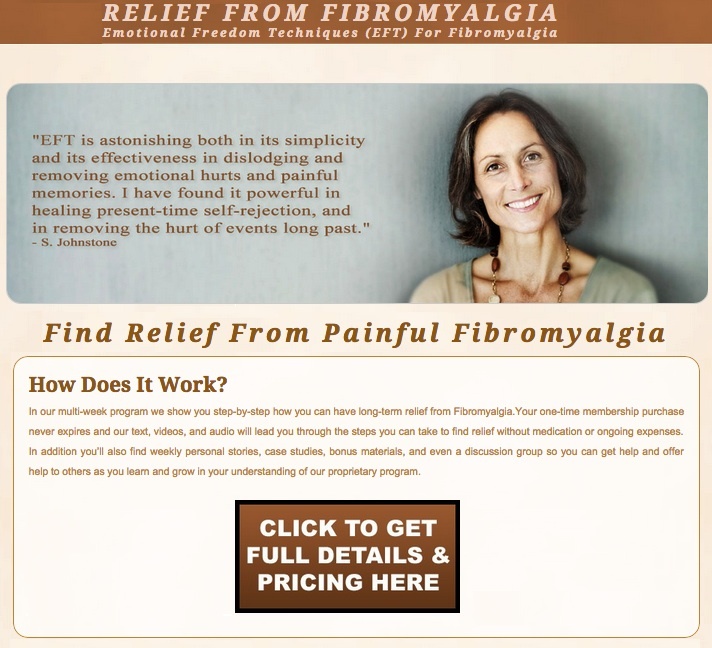 EFT user, Kristina Lukawska describes her recovery from fibromyalgia and its pain symptoms using EFT, with the help of EFT Master Andy Bryce, and EFT practitioner, Steven Vazquez. One Christmas Eve, I started to experience severe pain in my joints and muscles. They were heavy flu-like symptoms. After a few weeks of constant pain, I went to a doctor and to my great surprise, I was diagnosed with fibromyalgia. Suddenly, it seemed as if I was in pain most of the time. I would have a few good days followed by several bad weeks. I was a very active person who rarely watched TV, then everything changed as I became this person who would return home from work, often early, to crawl into bed to watch TV or sleep. Even worse than the pain was fatigue. It was nothing like normal fatigue. I had problems walking; each step needed conscious extra-effort from me. At times, lifting my arm or leg felt as if I was lifting heavy weights. I stopped doing many things automatically. Many activities, even really small ones, like getting a cup out from a shelf, needed special effort. I would become exhausted after simple tasks like brushing my teeth, even though I brushed them while sitting down. I had difficulties putting on my clothes. It was such a challenge to get ready for work in the morning. I felt like I was 100-years-old. I felt embarrassed; I did not know how to talk about it with my family and friends. I was probably afraid that they might tell me that I am overreacting, that it’s all in my head. I started to go to different alternative practitioners and they kept telling me that I'd "chosen my fibromyalgia." This did not help; it just made me feel guilty. 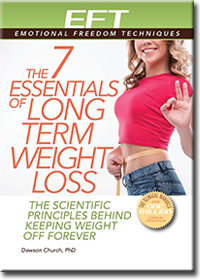 I tried different diets, including fasting, and I had some relief, but after a while the pain and fatigue would always return. About 5 months after my diagnosis, a friend of mine told me about EFT and I booked an EFT session. 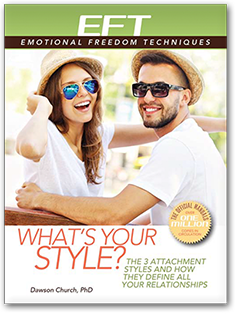 My first EFT session when EFT Master, Andy Bryce, sent me his love energy, it helped me experience the feelings of loving energy. It was the first time I was completely free of pain. It gave me strength and faith that I could be healed. After my first EFT session for Fibromyalgia, I noticed a big shift in my energy. I stopped being fatigued most of the time. I also noticed that it was getting much easier to listen to my intuition. Next, Andy worked with me on my core issue; which was my guilt and responsibility for my mother’s suffering and a belief: "I must suffer in my life." "I don’t believe I can free myself from suffering." "Even though I feel pain in this moment, I love being healthy." "Even though I am experiencing this pain from fibromyalgia, I’m grateful for this pain gift which brought me understanding and compassion, but I’m willing to learn from joy." I also tapped on experiences from my past associated with this. The following September, when I was at a Buddhist retreat, I started to feel a sharp pain under my left shoulder. After a while, the pain became more and more nagging. Since I have had fibromyalgia my sleep was shallow, especially in the mornings, after 2-3 AM. So, now, with this new pain, I woke up dozens of times throughout the night. I was growing increasingly frustrated; I was tired and desperate to get some sleep. The more I tried to resist the pain, the more it persisted. I woke up every hour to struggle with the pain. "Even though I am experiencing pain from fibromyalgia, I’m willing to receive the message that the pain gives me." After a while I found out that I needed this pain; I sometimes greet it with gratitude. I almost enjoyed my wakeful nights; it helps me practice holding my attention on my breath. "Even though I am experiencing pain from fibromyalgia, I’m grateful for the message this pain gives me and I recognize the fear behind it but I’m willing to see if my path to enlightenment can be filled with joy and gratefulness, as I deeply and completely accept myself." I went to Toronto for the Energy Psychology Conference. I attended the EFT workshop led by Steven Vazquez and for a moment I was free of the pain while the presenter was working with somebody suffering from fibromyalgia. Completely intuitively, I asked Steven for a private session. At the EFT session, I asked him to work on my specific back pain. We reconstructed the lineage from which the pain had come. The links brought me through the retreat and suffering to my childhood, my parents and my mother’s depression. A few times he asked me to stand up and kept his hands hovering inches away from my body while we were talking. We spent some time talking about my mother’s suffering. I wanted to free her from her pain and misery. The pain under my shoulder was getting more intense. He asked me to I give my mother back all the hurt in a symbolic way. I did it and I felt an enormous relief. A few moments after that I felt immense happiness. I started to laugh and I laughed with all my heart. I stopped laughing as I felt this huge wave of joy coming toward me. It felt like the gate to the Universe had opened. I saw two different spaces. I felt I was in both spaces. I felt pain in my back but it felt very different. It did not bother me at all. It was just something I once called pain. I was completely free of pain. Everything seemed to be lucid and transparent. After a while, I felt an even deeper wave of joy. I felt infinitely and entirely free and complete. I did not feel joy, I was joy. And everything else was joy. There was nothing before or beyond. There was no time. There was pure and absolutely perfect joy. Then gratitude emerged and I was so very grateful to Steven who was sitting in front of me. I hugged him and I felt profound gratitude to my teachers and my family, my neighbors, and all the people I used to be afraid of. For the next few days at the conference, I was filled with blissful joy. I felt such amazing lightness in my body. Each day I felt less and less pain in my body. After a couple days, I slept through the whole night free from pain. After ten days I was completely free of the pain. My life changed dramatically. I was freed of my past. Now I can create the future I want. A future where I am not a victim of fibromyalgia anymore. I took ownership for whatever has happened in my life. 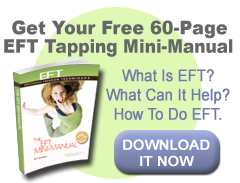 and I now know that I can take good care of myself with the help of EFT. I really relate to your story. I felt like I was reading my own when you talked about how the fibro changed your life. I've been thru the gamut of doctors and treatments, but I believe they fall short because they fail to address the root issues causing the pain. I have read some things about EFT and tried it a few times, but I didn't really know what I was doing. Then recently, my aunt bought me a book about using EFT for chronic pain and I just started reading it yesterday. Your story gives me hope that I can have that happy ending I'm praying for, so thank u for sharing it!